In spite of the arctic climate, raspberries grow well in Alaska. With lots of watering and patient care, you can have a bumper crop of raspberries. Unfortunately, the raspberries seem to come ripe all at once. That makes for a lot of raspberry dishes in the fall. This quick and easy pie is a perfect way to show off the bounty of your garden to your family, friends and guests. Prepare a single deep-dish pie crust recipe. Dock and bake as directed. Set aside to cool completely. If you are lucky enough to have our own raspberry garden, pick raspberries into small containers to avoid crushing the fruit. If using store produce, select firm berries. Rinse under cold running water and drain in colander. Turn out onto cookie sheet covered with a kitchen towel to wick away remaining water. In a medium saucepan, add a small amount of the water. Add salt, cornstarch and cardamom. Mix to make a smooth paste. Add sugar and remaining water. Stir frequently over medium high heat until thickened and mixture clears. Reduce heat to simmer and cook an additional 5 minutes, stirring frequently. Add Jell-O and stir until mixed. Remove from heat and set aside to cool and thicken. Carefully fold dried berries into cooled cornstarch mixture. 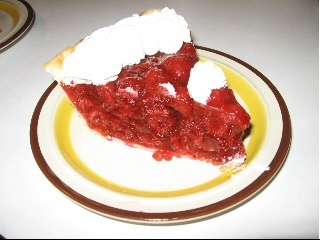 When berries are well covered, pour into prepared pie shell. Refrigerate to further set glaze. Prior to serving, prepare whipped cream. 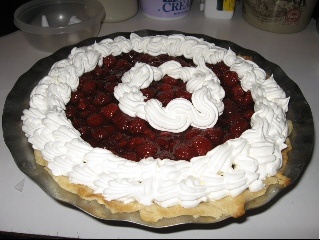 Spoon whipped cream into piping bag and apply generous ribbons to top of pie.